Here’s yet another post in my growing series of wondering if home prices are too high. Earlier this week, Black Knight Financial Services noted that home prices increased to within 3.8% of their all-time highs set back in June 2006. Other home price indexes (and specific metro areas) are spitting out new record highs. That may scare some folks, including myself, as I tend to be a bit more conservative when it comes to massive year-over-year home price increases. It has been about 10 years since home prices were defying expectations and now they appear set to finally surpass those old unsustainable highs. If you’re wondering why home prices have risen so much since bottoming around 2012, the answer is pretty simple. Home prices got way too cheap after the crash and inventory has remained very tight in spite of a flood of foreclosures. That, plus super low mortgage rates sprinkled in, has driven home prices higher and higher for months on end. But now we’re getting a little irrational again, at least in my opinion. I’ve been hearing that ill-fated sentiment of “Buy a house now or you may never get the chance!” SMH. Usually when people start saying things like that it isn’t long before it all goes very wrong. But as I noted in recent posts, we aren’t quite there yet. Indeed, a return to bubble-era home prices doesn’t mean the bottom is just going to fall out. Clearly this has played out in history many, many times. Otherwise how would we reach new highs to begin with? There’s no inherent problem with higher highs, but how quickly we get there could pose a threat, and overshooting the mark is also a major concern. A commentary released this week by Freddie Mac titled, “How to Worry About Home Prices,” attempts to answer that very question. But they even admit it’s a tough one to answer. However, they do outline a strategy we can use to determine if and when we’ll be facing another crisis thanks to unsustainable home prices. 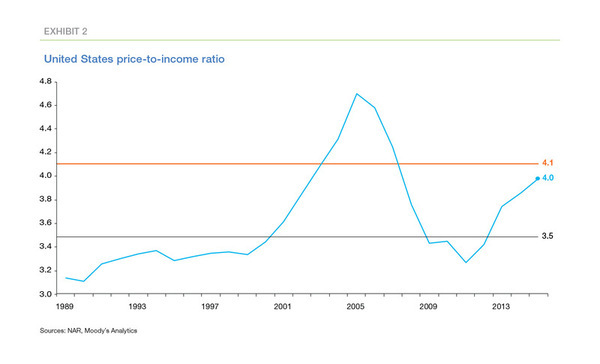 It rhymes with DTI, but is actually the price-to-income ratio used to determine if home prices have outpaced incomes. Freddie refers to it as the “clearest indicator of the long-run sustainability of house prices,” although still not entirely sufficient on its own. Basically you can use this metric to determine which metros in the United States require further scrutiny. The median PTI ratio between 1993 and 2003 was 3.5, so this is seen as “normal” according to Freddie. It climbed as high as 4.8 in 2005 before the housing bubble popped, and as low as 3.2 in 2011 when everyone lost confidence in the housing market. We’ve since returned to 4.0, which is above the norm but just below 4.1, which Freddie calls an “outlier threshold” and says separates the “usual” and “unusual” values of the PTI ratio. In other words, we’re getting into murky territory again, but that alone is not reason to freak out, at least not yet. We need to know why the PTI is high for a given metro to see if it points to another housing bubble. 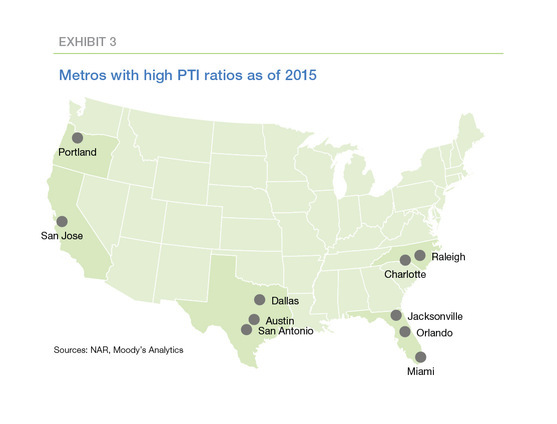 In red-hot San Jose, home to Silicon Valley, the PTI is a seemingly very high 9.6, but the outlier threshold for that specific region is 9.4. So while elevated, it’s just above its already historically high level. Then consider Dallas, where the PTI stands at just 3.4, but is actually above its outlier threshold of 3.2. This is why you have to examine each metro carefully, instead of attempting to determine if the entire nation is under or overvalued, or evaluating a PTI without historical and geographical context. Once we have our PTI, we need to ask three main questions to determine if a bubble is imminent. Are there nonfinancial reasons for the high PTI ratios? If a given metro’s PTI is elevated for nonfinancial reasons, then it could be perfectly fine because bubbles are financially driven. For example, if the region is growing rapidly because of employment demand in a specific industry, high home prices may be perfectly acceptable and sustainable. Limited supply is also driving home prices much higher. Additionally, the PTI ratio may be thrown off because of income inequality – put simply, if richer people are the ones buying homes they may actually have the income to absorb higher home prices. So it’s not a perfect science. Conversely, if home prices are rising rapidly for no apparent reason (such as easy credit) you might start to worry. Next, we have to ask if credit conditions are going downhill. As of now, mortgage underwriting is not even comparable to what it was before the previous crisis, and that’s a very good thing. There aren’t many stated income loans being originated these days, nor are borrowers allowed to finance investment properties with zero money down and 620 credit scores. Most of today’s mortgages are fully-documented, fixed-rate mortgages with nothing exotic whatsoever. In short, standards are a lot higher than they were and should stay that way for the foreseeable future. The only risk is these new 3% down mortgages, which could pose a threat as home prices continue to rise. If borrowers are putting next to nothing down simply to qualify because home prices have outpaced incomes, we could have a problem. The good news is that hasn’t happened too much lately. In fact, limited inventory and intense competition is forcing buyers to put more money down to beat out other offers. Lastly, we need to determine if leverage is increasing. Essentially, if mortgage debt is rising relative to home equity. At the moment, this isn’t the case. 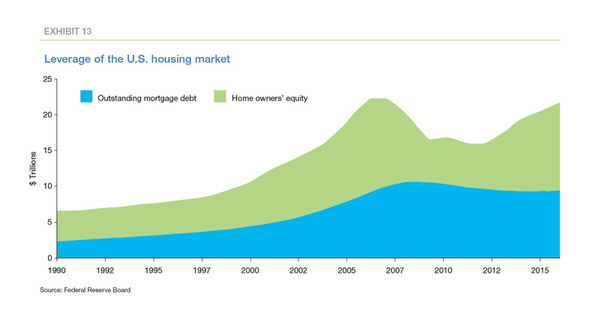 In fact, mortgage debt has declined while homeowner equity has increased. This gives homeowners a bigger cushion between what they owe and what their properties are worth. If they face some sort of financial crunch, those with a healthy cushion can sell if need be and probably still take in a tidy profit (and walk away with some cash in their pocket to use for rent and other needs). During the prior crisis, you couldn’t sell your home for more than the bloated mortgage balance, which led to even more downward price pressure and tons of short sales and foreclosures. As noted, we aren’t at that point yet and everyone appears to be paying off their mortgages. You don’t see too many interest-only loans, and definitely no pay option arms. This means today’s homeowner is actually building equity, unlike the crop of owners back in 2006-2007. A bit ominous but pretty spot on. The issue is that the way the housing market works, we’re bound to repeat history in the future. As home prices climb further out of reach, financing is eased to accommodate new buyers. We’re already seeing that. These buyers wind up purchasing too much house for their budget and when the housing market naturally cools off, they’re left with very little equity and a massive mortgage (and accompanying housing payment). I don’t see a scenario where it won’t play out like this…it’s basically ingrained in the market. So the next housing bubble is a matter of when, not if.